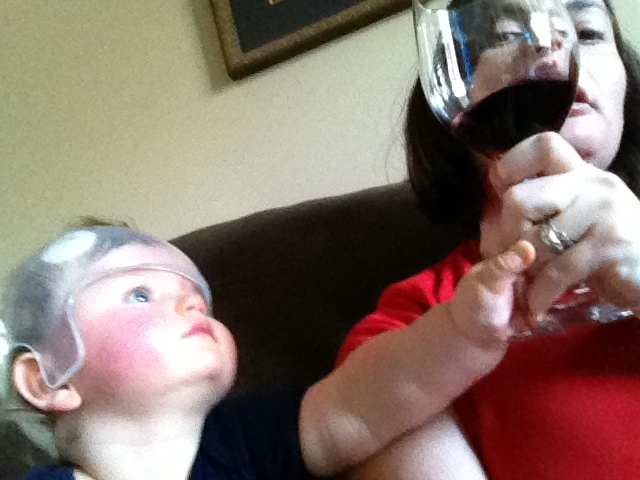 My one-year-old son Connor and I were stalked the other day. It happened at Target as I pushed his umbrella stroller through the women’s clothing section. Our stalker darted from clothing rack to clothing rack, unaware that I was watching out of the corner of my eye. I’d estimate that she was about five, and I’m pretty sure the reason she was following us was because she wanted to know what the thing was on Connor’s head. I would have just told her, simply said, “Oh, it’s just a cranial remolding helmet for the plagiocephaly that has occurred in the posterior region of his skull. No biggie.” Okay, that’s not really the way I would say it to a five-year-old, but I felt like I would ruin her fun by acknowledging her presence. Connor’s physical therapist had brought up the possibility of a helmet many, many months ago when the flattening of his skull was much more extreme. 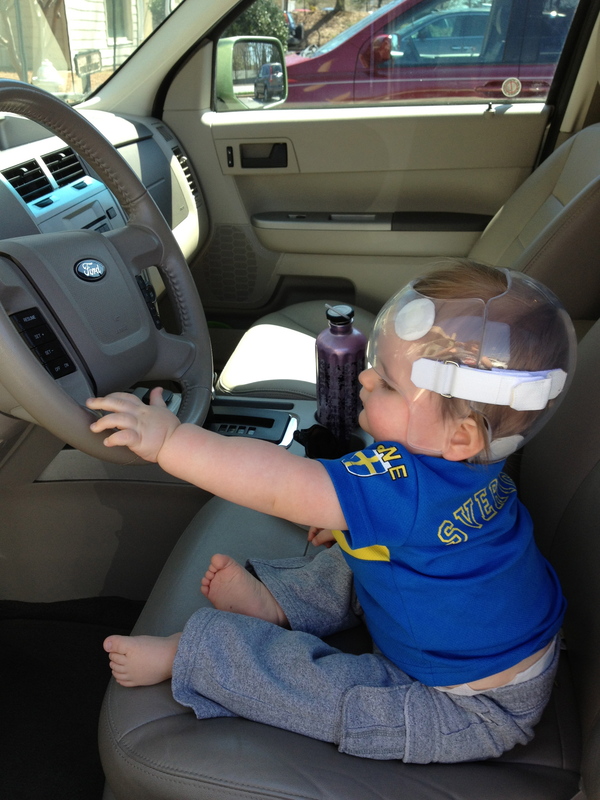 We were able to do a great deal of correction simply by positioning his head, but he was still left with some residual flatness as he neared the age of one, so his neurologist suggested moving forward. I wasn’t thrilled with the idea of a helmet, but accepted it. I made the appointment and took Connor for the fitting. There were pictures and sample helmets around the office. I actually found myself getting a little excited. Having to get the helmet wasn’t ideal, but I couldn’t believe how adorable some of them were. There were tons of designs to choose from, and I narrowed my top two down to one with airplanes and one with soccer balls. Then the orthotist returned and obliterated my adorable vision of Connor with airplanes circling his head. He felt very strongly that the clear plastic helmets were a better choice than the more popular styrofoam lined version that come covered in adorableness. Plastic ones were less likely to chafe the skin, they don’t absorb sweat so they don’t stink, they are easier to clean and you can see any skin irritation that may be occurring. They can also be vented by drilling holes in them. I nodded along in agreement and said things like, “Can’t argue with that.” But in my head I was cursing the stupid practical helmet, that for the same price, comes minus flaming soccer balls. How do you say, “I want the cute one,” after that? But stinky styrofoam? I could wash dishes with the sweat that pours from Connor’s head, so clear plastic it was. That wasn’t the only moment my stomach would drop during the appointment. To be honest, I went in having done no research. 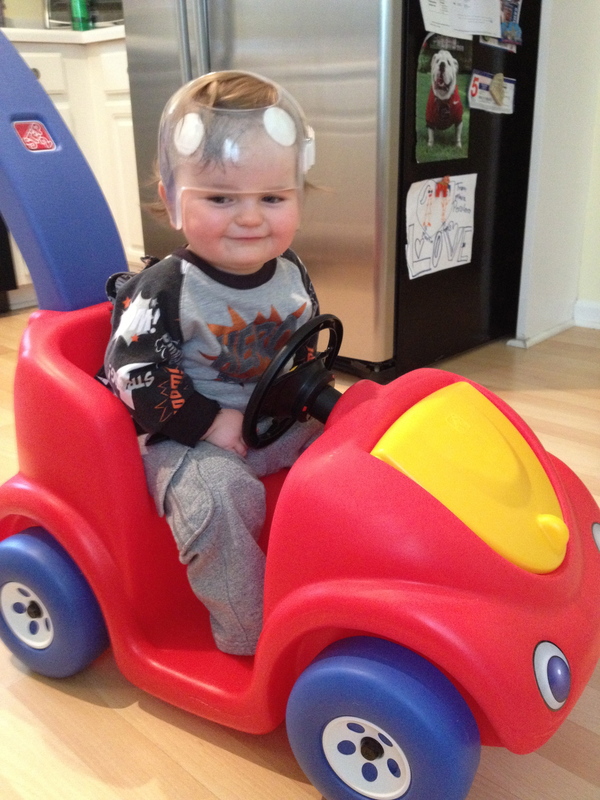 I’ve spent the last year reading so much about his genetic condition of tuberous sclerosis complex that I just wasn’t that worried about a helmet. I’d find out the details when I needed to know them. So I was not expecting to hear that he had to wear it 23 hours a day. I also wasn’t excited to hear that while treatment is usually three to six months, since Connor didn’t get his until he was a year old, his treatment would likely be closer to six months than three. Those were my only negative moments though. Do I love the helmet? Not so much. I hate that it makes his head sweat so much that the effects of a bath are destroyed ten minutes after I put it back on his head. I hate that my adorable child has to wear it 23 hours a day. Oh, he’s still adorable in it mind you, but no parent wants anything to prevent onlookers from having the full experience of perfection that is their child. I think if the last year had been “normal,” this helmet would really bother me. They’ve become much more common since the “Back to Sleep” campaign to combat SIDS, since putting babies on their backs has caused a huge increase in plagiocephaly (which is far preferable to SIDS, obviously). Nonetheless, I think I’d take it off him every time he left the house or someone came over. But the last year has not been normal. 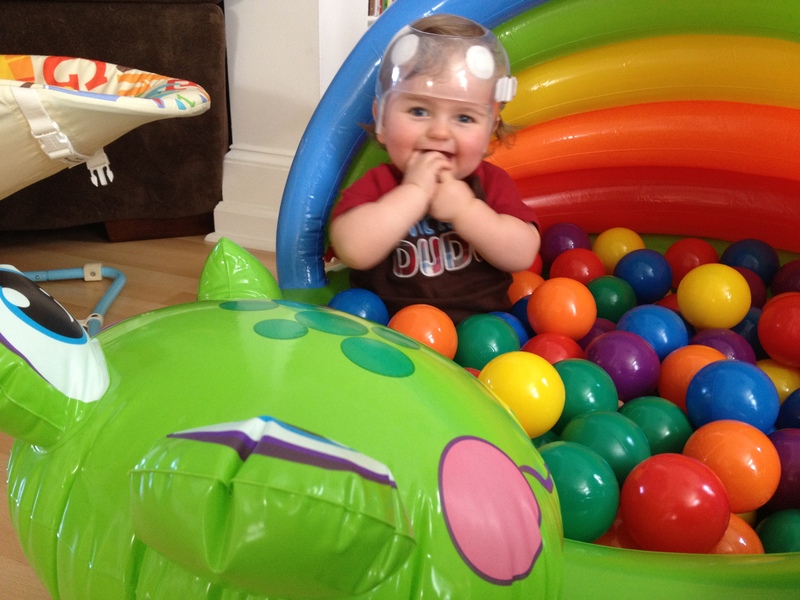 Connor was born with tuberous sclerosis complex, which causes benign tumors to grow in the organs. Currently, only his brain is affected, but we’ve dealt with five weeks in the NICU, seizures, brain surgery, daily administration of several medications, multiple EEGs, MRIs, infantile spasms, gross motor delay and speech delay. He has physical therapy, speech therapy and music therapy. I could care less about a stupid helmet. Perspective. I’m drowning in it, whether I like it or not. And it only took me 31 years to find it. what a cutie! my deb is 23 and has TSC too. Thank you! And thanks for stopping by and commenting. I hope Jacob is doing well!